With only a handful of exceptions, including stopping the spread of WMD, there are sizable differences between Republicans and Democrats on the 26 foreign policy goals in the survey by Pew Research Center, which was conducted Nov. 7-16 among 10,640 adults. And on several foreign policy goals, particularly the importance of maintaining U.S. military superiority, there also are notable gaps between older and younger adults. U.S. allies. 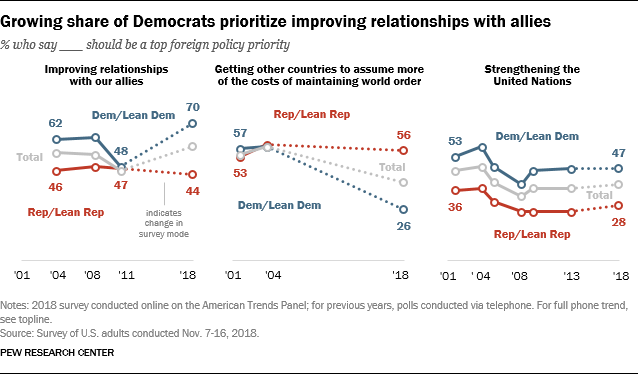 Improving relationships with U.S. allies ranks at the top of Democrats’ foreign policy goals (70% top priority) but is a middle-tier objective for Republicans (44%). In addition, Republicans are 30 percentage points more likely to say that getting other countries to assume more of the costs of maintaining world order should be a top priority for U.S. foreign policy (56% vs. 26%). U.S. military superiority. A large majority of Republicans and Republican-leaning independents (70%) say that maintaining the U.S. military advantage over all other countries should be a top priority for the U.S.; just 34% of Democrats and Democratic leaners rate this as a top priority. Notably, maintaining U.S. military superiority is a top priority for a majority of adults ages 50 and older (62%). But just 30% of those younger than 30 say this should be a top foreign policy priority. Refugees and immigration. While only about four-in-ten Democrats (39%) say that aiding refugees fleeing violence should be a top foreign policy priority, far fewer Republicans (11%) say the same. Republicans are far more likely than Democrats to rate reducing both illegal immigration and legal immigration into the U.S. as major priorities. The partisan divide on the importance of reducing illegal immigration, 48 percentage points, is wider than at any point in the past two decades (68% of Republicans vs. 20% of Democrats). Russia, Iran, China and North Korea. 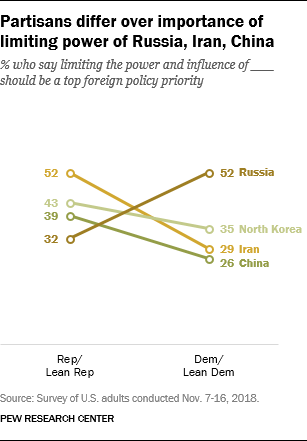 Partisan opinions about limiting the power and influence of Iran and Russia are nearly mirror images: 52% of Democrats say reducing Russia’s power and influence should be a top priority, compared with 32% of Republicans. By contrast, 52% of Republicans rate limiting Iran’s power as a top goal, compared with 29% of Democrats. Reducing China’s power and influence is not a leading goal for either party, but more Republicans (39%) than Democrats (26%) rate this as a top priority. There is greater partisan agreement on North Korea: 43% of Republicans and 35% of Democrats say limiting North Korea’s power and influence is a top priority. Trade and economic relations. Reducing the U.S. trade deficit with other countries is viewed as a top foreign policy priority by 54% of Republicans, compared with 33% of Democrats. And more Republicans (51%) than Democrats (40%) say promoting U.S. economic interests abroad should be a top foreign policy priority. Among the public overall, attracting skilled workers from other countries (16% top priority), promoting democracy in other countries (17%) and finding a solution to the conflict between Israel and the Palestinians (18%) rank near the bottom of the long-range foreign policy goals. However, for each of these items – indeed, for all 26 priorities in the survey – majorities say they should be given top priority or some priority. Younger Americans (those under 30) are generally less likely to say that the issues presented in the survey should be a “top priority.” Across the 26 items included in the survey, those under 30 are an average of 10 points less likely than those 65 or older to say each should be a “top priority.” In some cases the gaps between older and younger Americans are much larger. Younger Americans are much less likely than their older counterparts to prioritize limiting the power and influence of several prominent foreign powers. Only about three-in-ten young people feel that the U.S. should place top priority on limiting the power and influence of Russia (29%), Iran (29%) and North Korea (26%). Even fewer say the same about China (21%). 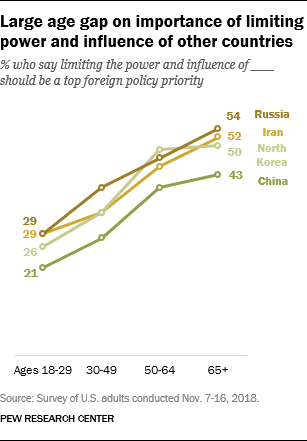 By contrast, Americans 65 or older are much more likely to say that limiting the influence of these countries should be a top priority. For instance, 54% say limiting the power and influence of Russia should be a top priority for the U.S. There are a few issues that younger people place greater importance on than older adults. 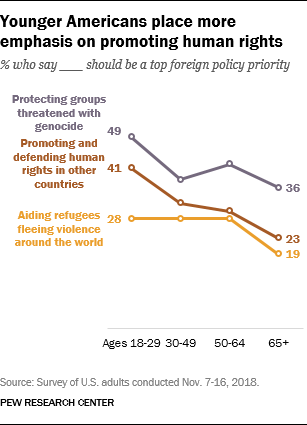 About half (49%) of those ages 18 to 29 say the U.S. should make protecting groups or nations threatened with genocide a top priority; fewer of those 65 or older (36%) say the same. Younger people are 18 percentage points more likely than the oldest adults to say that promoting and defending human rights in other countries should be a top priority (41% vs. 23%). When it comes to aiding refugees fleeing violence around the world, those younger than 65 are more likely than those ages 65 and older to say this should be a top foreign policy priority for the U.S.
There’s also a substantial age divide in the priority given to goals involving the U.S. military. Americans 65 and older are more than twice as likely as those under 30 to say that the U.S. maintaining its military advantage over all other countries is a top priority (64% vs. 30%). 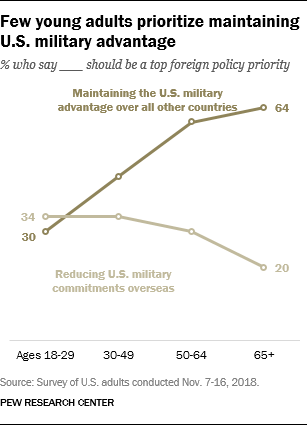 Younger people are more likely than older people to say that reducing U.S. military commitments overseas should be a top priority (34% vs. 20%). Age gaps also are seen in dealing with terrorism. About eight-in-ten of those 50 and older (81%) say that taking measures to protect the U.S. from terrorist attacks should be a top priority, this figure drops nearly 20 points among those under 50 (63%). When asked about whether the U.S. should prioritize taking measures to seek out and destroy terrorist groups in other countries, about a quarter of Americans under 50 (27%) say it should be a top priority compared with 44% of those 50 or older. The public’s views of long-term goals for U.S. foreign policy have shifted over the past two decades. In many cases, partisan divides have emerged – or widened – when it comes to how much priority should be placed on key international goals. In the current survey, a sizable majority of Democrats and Democratic leaners (70%) say improving relationships with our allies should be a top priority, while significantly fewer Republicans and Republican leaners say this should be a top priority (44%). This is one of the largest gaps observed on this issue since the question was first asked in 2004. The share of Democrats who view improved relationships with allies as a top priority is much higher than it was in 2011, during Barack Obama’s first term, when 48% said this. There is a wide partisan gap over the importance of getting other countries to assume more of the costs of maintaining world order: 56% of Republicans say this is a top priority, compared with just 26% of Democrats. When the question was last asked in 2004, comparable shares of Republicans (59%) and Democrats (58%) said this issue should be a top priority. 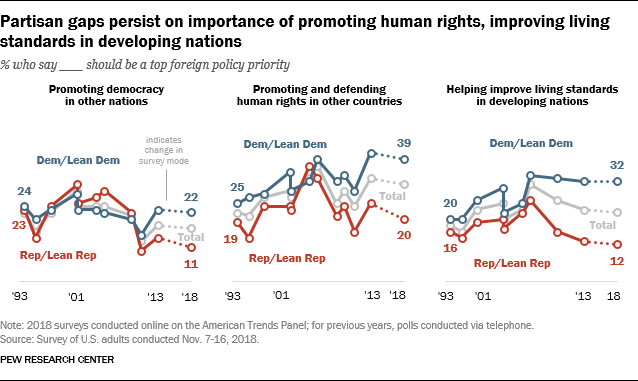 Democrats are far more likely than Republicans to prioritize promoting democracy in other nations, promoting and defending human rights abroad, and helping improve living standards in developing nations. Though neither party rates the promotion of democracy in other nations as a particularly high priority, Democrats are twice as likely as Republicans to say this should be a top foreign policy goal (22% vs. 11%). Views are about the same as they were in a telephone survey conducted in 2013. A similar pattern emerges on promoting and defending human rights in other countries. About four-in-ten Democrats (39%) say promoting human rights abroad should be a top priority. Fewer Republicans (20%) prioritize this goal. This partisan gap is little different from 2013, but wider than at most other points measured over the past 25 years. Today, just 12% of Republicans say improving living standards in developing nations should be a top priority. More than twice as many Democrats (32%) say this should be a top priority. Republicans are more likely than Democrats to view the promotion of U.S. business and economic interests a top foreign policy priority. This also is the case in views of protecting U.S. jobs and reducing the trade deficit with other countries. Today, roughly half of Republicans (51%) say promoting U.S. business and economic interests abroad should be a top priority in foreign policy. Fewer Democrats (40%) say this should be prioritized. In 2004, 40% of Republicans and 32% of Democrats said promoting U.S. business interests should be a top priority. Among the public overall, protecting the jobs of American workers continues to rank among the top priorities for U.S. foreign policy, though the share who calls this a top priority is somewhat lower today (71%) than in 2013 (81%). 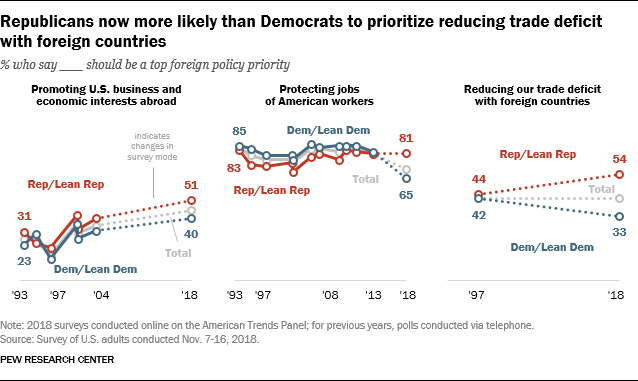 More Republicans (81%) than Democrats (65%) say protecting American jobs should be a top U.S. foreign policy priority; this issue is among the top three priorities for members of both parties. When it comes to reducing the U.S. trade deficit with other countries, a double-digit gap currently divides Republicans and Democrats. Over half of Republicans (54%) say “reducing our trade deficit with other countries” should be a top priority, while just a third of Democrats (33%) say the same. When the question was last asked in 1997, about equal shares of partisans called this issue a top priority. 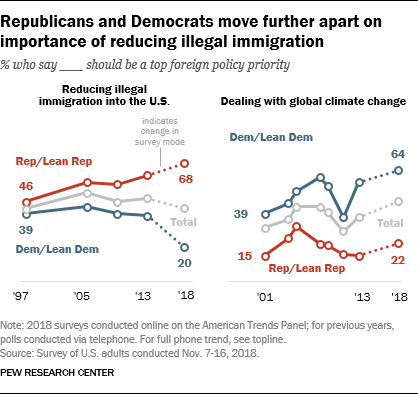 Some of the largest differences between Republicans and Democrats are seen in views of how much priority should be given to reducing illegal immigration and dealing with global climate change. Nearly seven-in-ten Republicans (68%) say that reducing illegal immigration into the U.S. should be a top U.S. foreign policy goal; just 20% of Democrats say the same. A partisan gap on prioritizing reducing illegal immigration has existed since 2005, but the current gap is especially wide. Since 2013, the share of Democrats who say reducing illegal immigration should be a top priority has declined significantly, from 38% then to 20% today. Democrats continue to be more likely than Republicans to say dealing with global climate change should be a top priority. About two-thirds of Democrats (64%) say this, compared with just 22% of Republicans. A partisan gap has existed since this question was first asked in 2001, but it is as wide as it has ever been during this period.